This week, the Umami Burger chain rolled out its latest creation: a so-named Pumpkin Spice Latte Burger that might finally, hopefully, mark the end of America’s fascination with all things pumpkin-spiced. But is it actually any good? To find out, we asked New York critic Adam Platt to swing by, give it a try, and let us know what he thought. So what did you think when I asked you to go try out this new Pumpkin Spice Latte Burger? I thought you’ve got to be goddamned kidding me. A burger with a sugary pumpkin cream and coffee on it can’t possibly be good. I mean, nothing with pumpkin spice on it is actually good, except maybe the original Starbucks latte, which I’m I ashamed to admit, I’ve never actually tried. You haven’t missed too much. Well, I suppose this is the time of year. Everyone’s throwing pumpkin-spice memes out there; they don’t even care if it’s good or not. They just want people to click on it and kvell about how disgusting it is, which, of course, is just what people like me are supposed to do. We’re just falling into their trap. But I’d imagine Platt’s reading public is eager to hear what a discerning professional critic has to say about the PSL Burger, so I’m happy you went. What did you think? After you order, to prepare you for the grim experience, they present you with a laminated card describing exactly what’s in the burger besides the inevitable meat and bun: pumpkin-pie-spiced mascarpone, whatever that is; roasted garlic aïoli; a kind of Japanese squash called Kabocha; and a strange substance called “coffee molasses drizzle.” So I read this and I think to myself, How can this be good? It’s almost like they want you to hate it. But all of the Umami Burgers sound weird, and a lot of them are pretty good — so I’d see that and think, Maybe it’s going to be interesting. Wrong! Everything about these bizarre toppings ends up canceling out the essential burger-ness of the experience. The Umami Burger bun is sweet to begin with. The Kabocha is sweet, too, and caked in a greasy batter, like some kind of bizarrely candied onion ring. The toppings are sweet and thick and when you bite into the burger, they mingle unpleasantly on the tongue with the fatty grease from the meat. That is a less-than-appetizing description, I’ll admit. The whole thing ends up tasting like a strangely savory meat-flavored cupcake. But did you finish it? Of course not. In a vain attempt to find a kind of burgerlike relevance in the experience, I doused mine in a little ketchup, which was a mistake. The sweet thickness of the ketchup added to the weirdly sweet thickness of the “latte flavored” marscapone. Then the last thing you taste, however, is that tragic coffee-flavored “drizzle,” which leaves you with a sense of rusty bitterness. What you’re describing sounds more like an actual pumpkin spice latte — and less like a burger. It’s possible that you’re not their ideal target audience for this particular creation. Let’s give one star for the patty, although the Umami patty seems to grow fatter, greasier, and less interesting as more Umami outlets open around the country. Minus a star for the messy presentation, and minus another three stars for the greased up Kabocha rings, the cloying pumpkin marscapone, and that tragic coffee drizzle. There you have it. 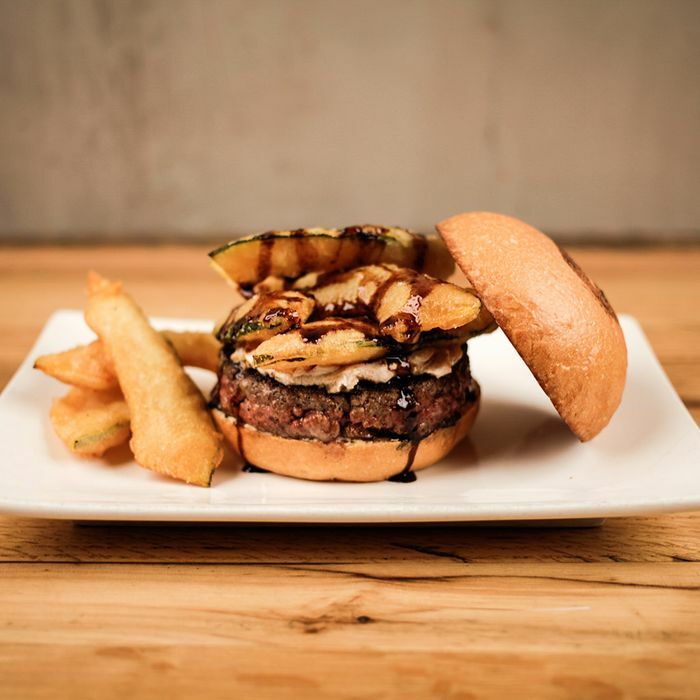 Platt gives the PSL Burger at Umami an unprecedented negative three stars. Not recommended, not worth a special detour, not worth trying even once. If you’re a fan of pumpkin spice lattes and of burgers, Platt respectfully recommends you enjoy them separately, in different restaurants, and preferably, at different times the day.